In the diagram below, angles BAC and CAD are consecutive. The term Òrelative arcÓ means Òthe length of the arc that the angle cuts from a circle relative to the circleÕs circumference.Ó Put another way, the term Òrelative arcÓ means Òthe fraction of a circleÕs circumference that the angle cutsÓ. JosŽ measured angle BAC, getting a relative arc of 0.10. Susan measured angle CAD, getting a relative arc of 0.07. JosŽ said that angle BAD must have a relative arc of 0.17. Susan objected that you cannot simply add relative arcs, because the circles have different circumferences. Who is correct, JosŽ or Susie? Justify your answer. What does your answer imply about when you can add the relative arcs of consecutive angles to get the relative arc of the angle they form together? Lisa: The angle is 0.17. Jill: No itÕs not, itÕs 60 degrees! Lisa: ThatÕs what I said. 60 degrees is 60/360, which reduces to 0.166666 and I rounded that to 0.17. 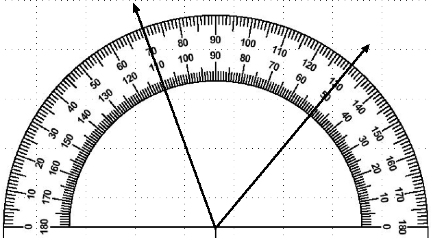 Jill: But that says it is 0.17 degrees, and thatÕs a really tiny angle. And this one is not tiny. Lisa: I didnÕt say degrees. I said 0.17, like in relative arc. Jill: You canÕt turn a number of degrees into relative arc! You didnÕt divide an arc length by a circumference!